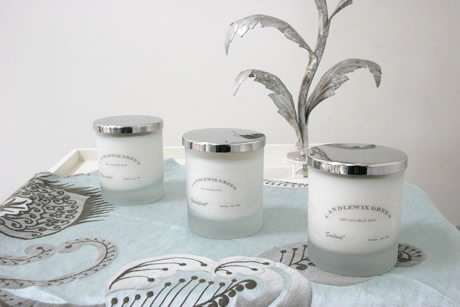 The candles are made with soy wax which is non-toxic, natural and virtually soot free (any soot produced comes from the wick). Soy also has a longer burn time at a lower temperature with better fragrance throw and scent retention. Fragrances include: Blackberry and Basil, Cherry Blossom, Christmas, Citrus Basil, Cut Grass, Dew Drop, Dozen Red Roses, Enchant, Fern and Moss, Fig Royale, Grapefruit, Grenade Spice, Lavender Spice, Lemongrass & Lime, Orange Blossom. 15 fragrances to choose from with unique scents like Dozen Red Roses and Cut Grass. Come to our showroom to choose your favorite fragrance or just order a mixed box of six and try them at home. To order email Victoria at candlewixgreen@hotmail.co.uk with your order, name, address and phone number. The candles are competively priced at £16.00 each or 2 for £30.00 plus £ postage and packing.